In the most basic of anatomical terms, the eye is divided into three sections: the anterior chamber, the vitreous chamber and the posterior chamber. The vitreous chamber is positioned at the back of the eyeball. It is the largest of the chambers and takes up around 80% of the eye. The vitreous humour (also known simply as the vitreous) is a clear, colourless fluid that fills the space between the lens and the retina of your eye. 99% of it consists of water and the rest is a mixture of collagen, proteins, salts and sugars. Despite the water-to-collagen ratio, the vitreous has a firm jelly-like consistency. What does the vitreous humour do? The vitreous performs a vital role in protecting your eye. Most importantly, it helps it to hold its ‘spherical’ shape. The vitreous also comes in contact with the retina (the light-sensitive tissue at the back of the eye that acts like the film of a camera). The pressure of the vitreous humour helps to keep the retina in place. 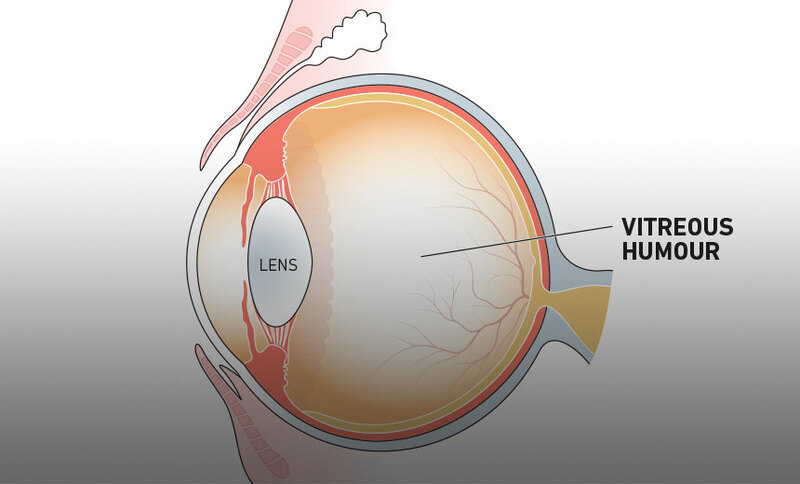 What happens with the vitreous over time? As you age, the vitreous liquefies and shrinks, much like a bowl of gelatin shrinks with time. Portions of the mixture of collagen and proteins also become ‘stringy’, like the white of an egg does as it ages. These stringy entities float around the rest of the vitreous, casting a shadow on the retina. These are called ‘floaters’ – you may notice them as specks, strings or other shapes that you see just out of the corner of your eye. The vitreous itself does not adhere to the retina. However, on the surface of your retina there are literally millions of fine fibres. Because the vitreous shrinks as you age, these fibres can ‘tug’ on the retinal surface. If this shrinkage causes a section of the fibres to pull away all at once, it is called a vitreous detachment. These are common in people over the age of 65 and extremely common in people over 85. A vitreous detachment is more likely to happen if you have suffered from myopia (short-sightedness), have had an eye injury or if you have experienced eye inflammation (uveitis). In itself, a vitreous detachment should cause no problems with your vision other than an increase in floaters. While this can be annoying, you should find that they don’t affect your day-to-day life. The only risk factor you would face is the slightly increased chance of a retinal tear or the more serious, retinal detachment. If you notice a reddish tint to your vision and your vision is blurred, you may be suffering from a vitreous haemorrhage. Although there are no blood vessels located in the vitreous, there are vessels in the surrounding retina – a vitreous haemorrhage can occur when one of these ruptures. Other symptoms of a vitreous haemorrhage include an increase in floaters and sensitivity to light. Occasionally, a vitreous detachment will cause a ‘clump’ of the fibres on the surface of the retina to create a tear in the sensitive retinal tissue. Even the smallest of tears in your retina will need to be treated, because it will increase the risk of a retinal detachment. Retinal tears can be sealed with lasers or cryotherapy. The most serious disorder involving the vitreous humour, a retinal detachment, is a medical emergency. It happens when liquid (vitreous) seeps through a retinal tear, causing the retina to ‘peel’ away from the supporting layers (much like wallpaper peels away from the wall when it’s damp). There are a number of issues related to the vitreous humour that can lead to you requiring a procedure called a ‘vitrectomy’. If you suffer from a retinal detachment that threatens the macula, a tear or tears in your retina, a vitreous haemorrhage or another problem that affects the retina, you may require this surgical procedure. Your ophthalmologist will remove the vitreous and then replace it with silicone gas or oil. This will restore normal pressure in your eye. Click here for more information on this and other retinal treatments. The vitreous chamber is the largest cavity in the eye, which makes the vitreous humour the most prominent liquid in the eye. Present at birth, it changes little until we enter our fifth decade when it begins to shrink, which can lead to disorders ranging from harmless floaters to a vision-impairing retinal detachment.